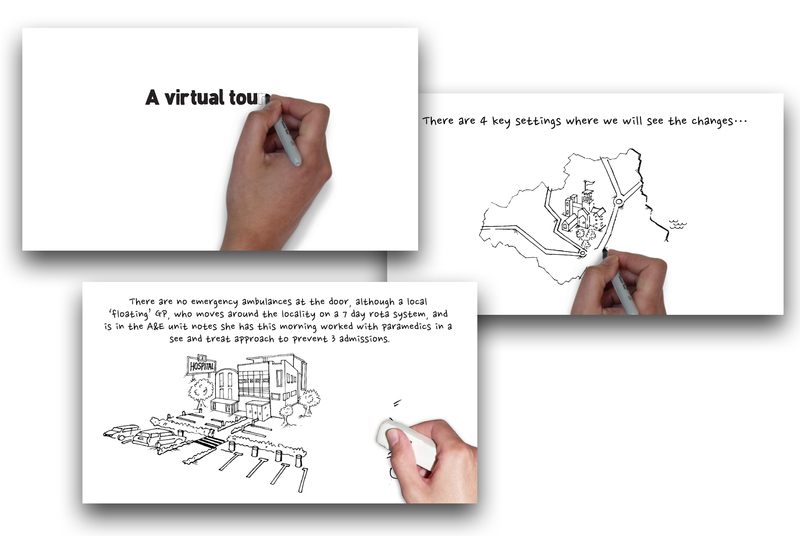 Whiteboard animation to communicate the future of NHS services. The project involved illustration and animation work to help NECS communicate improvements to the future of NHS services to an internal audience. We were asked to help devise an easy way of getting a new concept across to staff and stakeholders in a variety of settings. The solution needed to be fairly low-budget, clear and easy-to-understand. We agreed that a ‘walk-through’ of the plans for the changing services would be ideal, in an illustrated form to minimise expense. After drafting an initial storyboard with simple sketches, the content was agreed prior to final illustrations being drawn up. The voiceover and animation production stage completed the project. The final animation was used in meetings, at conferences and by individuals on their personal computers, and was well-received. We have since been commissioned to produce further animations to support communication of New Models of Care.